State Representative Avery Bourne (R-Raymond) announced that The Illinois State Board of Education (ISBE) is issuing vouchers today to the Illinois State Comptroller, paving the way for the new tier funding portion of fiscal year 2018 Evidence-Based Funding to flow to the State’s most under-resourced districts. ISBE issued the vouchers, concluding months of partnership with school districts and lawmakers to deliver accurate and on-time distributions. 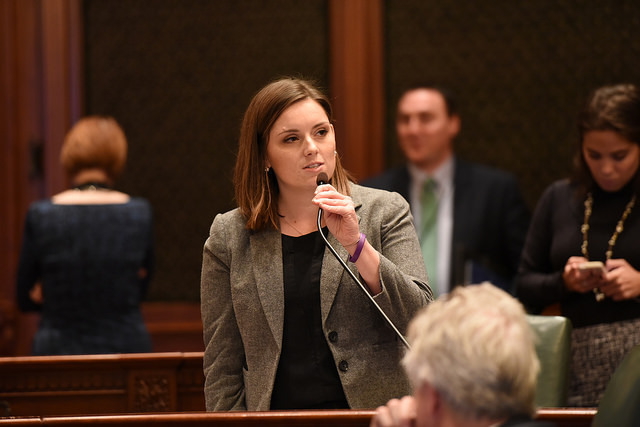 Representative Bourne explained that in past Illinois operated on a decades-old formula that perpetuated an education funding system that did not send state dollars to the school that needs it most first. Lawmakers came together this General Assembly to remedy the broken formula, reached a compromise, and on August 31, 2017, the Evidence-Based Funding for Student Success Act became law. Since the passage of that landmark legislation, the State Board of Education found fixes that needed to be made legislatively before the full model could be implemented. Bourne also co-sponsored that fix to the formula which now makes full implementation possible. You can learn more about the Evidence-Based Funding formula at https://www.isbe.net/ebf2018.